This patent covers the invention of a waterproof adhesive suited for a variety of applications including resilient flooring over concrete with unlimited moisture and pH levels. SANTA ANA, Calif. – Formulators is proud to announce the issuance of patent protection for its waterproof adhesive technology marketed as the Aquaflex™ moisture mitigation system. The patent for invention numbered 20,130,131,244 covers an adhesive mixture suited for flooring installations over concrete with a combination of unlimited moisture and pH. Additionally, Aquaflex™ installations become waterproof to topside moisture intrusion from sources like maintenance water, leaking pipes and standing water. 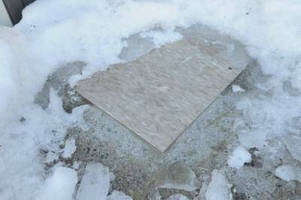 Aquaflex™ has also been proven effective for installations over concrete backfill less than 10 days old. "For decades the flooring industry used solvent-born (yet moisture tolerant) adhesives for flooring installations over concrete. During the mid-90's, in order to improve indoor air quality, these formulations were replaced with water-based chemistry. It soon became apparent that the new adhesives would fail in the presence of elevated concrete moisture. Unfortunately, the industry's solution was not to address the failing adhesive chemistry. Instead, the industry offered flooring contractors and building owners an additional product to purchase. This second product became the industry standard; a difficult to prep and apply, epoxy-type coating meant to serve as a protective moisture barrier," said Benny Dickens, Inventor/Founder/CEO at Formulators. "Formulators has always equated flooring failures, due to elevated concrete moisture, as first and foremost adhesive failures. Correctly identifying the source of the problem is the first step toward its solution," said Mr. Dickens. "The flooring industry must evolve from recommending secondary protective barrier coatings, while continuing to promote the same tried and failed moisture sensitive adhesives. These barrier strategies simply overlook the fundamental issue. To avoid the liability of adhesive failure, fix the glue and Aquaflex™ represents that evolution." Formulators prefers to work through its nationwide network of commercial contractors, independent sales representatives and Aquaflex™ trained technicians. Aquaflex™ is now specified by several, major national retailers and hospital networks. Aquaflex™ is not just a proven advancement in adhesive performance; care was also taken to insure Aquaflex™ was developed with safety and environmental sensitivity in mind. The result; Aquaflex™ has been independently certified "0" VOC, GREEN bio-based, qualifies CHPS®* and will contribute LEED®*. The patented adhesive has several formulation variants for differing flooring types including: VCT, rubber flooring, carpet tile, luxury vinyl tile and plank, sheet vinyl, ESD tile, quarry tile and even artificial turf. Aquaflex™ is sold by the square foot as a complete moisture mitigation system that includes proprietary waterproof cementitious self-leveling, concrete prep and crack repair products, application trowels and a specialty formulated adhesive remover for clean-up. Formulators, based in Southern California, was founded in 2000 as a research/development/manufacturer focusing on niche products to address failures in conventional solutions. Formulators produces Aquaflex™, a specialty building products line of flooring installation and repair products centered around its patented waterproof adhesive technology. For further information on Formulators or the Aquaflex™ moisture mitigation system, please visit www.formulators.com. *The Collaborative for High Performance Schools (CHPS) is the United States' first green building rating program especially designed for K-12 schools. *LEED, or Leadership in Energy Environmental Design, is a green building certification program that recognizes best-in-class building strategies and practices. Theft Protection System eliminates missing tools. Anti-Theft System protects propane tank and trailer.